Keep dumbbells in your routine, but boost your results by adding kettlebells. If you've ever encountered kettlebells in your gym, you'd be forgiven for mistaking them for a giant iron doorstop. With their huge metal body and handle on the top, they look like the last thing you'd use to get a strong, sleek, slender physique, but they're a highly effective tool for burning calories and shedding fat. You needn't switch all your training to kettlebells straight away though. Try combining kettlebells with their more conventional gym cousin -- dumbbells -- to get you started. Learn the kettlebell basics. You might think that if you can lift one type of weight, you can lift them all, but you'd be wrong. The biggest mistake kettlebell newbies make is not hiring a qualified coach to teach them the basics, according to kettlebell trainer Neghar Fonooni of the online site Eat, Lift and Be Happy. It might mean you have to hold off on buying those new jeans for a few weeks, but a good kettlebell coach is worth her weight in gold. Ask one to show you how to correctly perform swings, presses, snatches, goblet squats and Turkish get-ups. Alternate dumbbell exercises with kettlebell ones. Some exercises are interchangeable -- the overhead press or one-arm row for example can both be performed with dumbbells or kettlebells. Employ dumbbells for them in one workout and kettlebells in the next. Add swings onto the end of an upper-body workout, advises Russian Kettlebell coach Tracy Reifkind. Swings are a seriously tough exercise that burn calories, increase fitness and strip fat, but also build your glutes, hamstrings and lower back. Swings are the perfect way to include both strength training and cardio in a session. Complete the main portion of your upper-body workout, focusing on exercises like presses, rows, pushups and chin-ups, then perform 10 to 15 minutes of kettlebell swings. Try swinging for 30 seconds, resting for 30 seconds and repeating for the duration. Look after your hands. The one thing many girls don't consider when transitioning to kettlebells is hand care. Those bells can really take a toll on your skin and leave you with unsightly callouses. Rather than wearing weightlifting gloves, which can interfere with your grip, try using lifting chalk, filing down any rough skin and using a pumice stone to keep your hands in tiptop shape, advises weightlifting coach Sally Moss of Ultimate Performance. Certain lines of kettlebells come in increments of 4 kilograms. 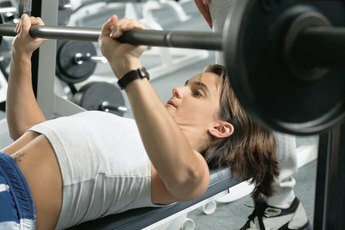 Most women already used to weight training should be able to handle an 8- to 12-kilogram bell, while advanced trainers may be able to swing a 16-kilogram bell. If you're completely new to weight training, begin with a 4-kilogram bell. Work with appropriate standard-weight bells to your level if your gym has weights of 5, 10, 12, 15, 20, 25 and 30 pounds instead. Check with your doctor before starting a training routine, especially if you've been out of the gym for a while. 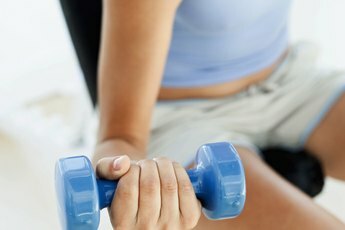 Bodybuilding.com: Swing For The Fences: Kettlebell Training - Burn Fat And Build Muscles!